Thank You for all your kind and thoughtful comments on Facebook and email. You can't help but feel the love and concern which fills my heart with joy and gladness for having such an amazing online family. Fur babies are really part of our lives and definitely part of our families. It's so nice to know that so many of you totally understand this. Last week was not one that I will ever really want to remember. The week started out with Buzzy the cat being so sick from what I feel was something he consumed in the barn. Next, it was Cooter who was off to the vet with an ear infection and strained neck. Cooter is my oldest, so it was such a surprise when we found that Zanie (Cooter's son) passed away yesterday morning. I think the saddest thing for me is that I wish I could have been with him as he passed...to let him know he was loved. Sometimes that is the grace of being with your pet when they are to be put down. You are there and they know you are there with them. When I moved out to the country some fourteen years ago, I thought how awesome it would to breed basset hounds. I always loved any kind of hound because of their sweet faces and their loving and protective characteristics. But soon I was to realize that I was not cut out to breed dogs. My heart was too soft...I couldn't bare seeing all..."my"... puppies go to new homes. It was tough and I made darn sure they all went to compassionate and caring families. I know, without a doubt, that my fondest memories of being out here in the country will always be... having all eight of my kiddos romping around my heels...playing with each other in the sun and of course...chasing after tennis balls. 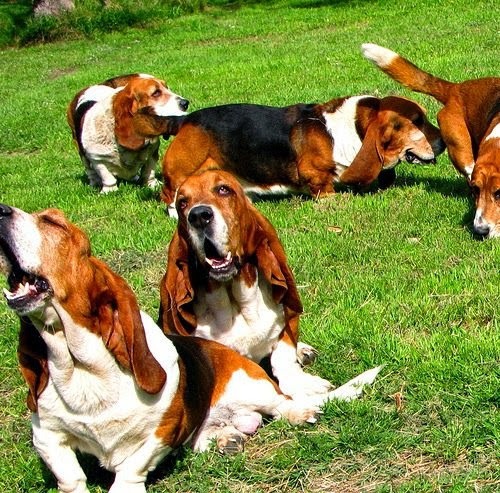 There is nothing, to me, more joyful and sometimes scary to hear and see a pack of eight basset hounds coming for you... to give you what they do so well...slobbery love. And now it's time for me to move on to the next chapter... holding dear to my heart the thoughts and memories that will shape the things to come. Beautiful put. So sorry for your lose. HUGSSSS, Oliver got really sick while I was away at CHA I had to rush him to the vet and he was severely dehyrated, all the while he was being poked and prodded with needles I had to not think about what if I had lost my best friend of 10 years. Fortunately he is now recovered and doing well , I can only imagine how sad you must be to have lost a faithful pup. They are definetly a family member. Thank you for posting the pics they really are sweet doggies. It's so hard when our fur kids go to the Rainbow Bridge. I've got quite a few waiting for me to come see them! Sending you and Cesar more hugs. So sorry for your loss. I know all too well the sorrow that comes when our beloved pets cross over on the Rainbow Bridge. I find solace to know that one day when my time is up that all my beloved pets will be waiting on me. Hugs!! Jim, your heart is as big as Texas. I pray you will have peace and joy with the fur babies you have with you still. Gentle hugs. I am so sorry to hear about your baby, I read the most awesome thing about dogs lives being shorter than ours because they love so much and it is true. May you always hold dear the happy memories of your pooch. I believe he knew he was loved. Sometimes dogs go away to be alone to die, he may have wanted that. So don't be upset. He was not alone, you were there, if not in body in mind. And he knew that, too! Such an beautifu post. Yes, it IS sad but it is also a wonderful tribute to what you hold dear. Our memories of all who have left us keeps them in our hearts and no one can take that away. As you well know, I've been going through some dark days with my sweet Simon and support from you and other friends has helped keep my spirits up. I'm happy to report that he is almost back to normal...Praise God and St. Francis for answering my prayers once again!!! wow... 8 bassetts at once! And the puppies must have been just too cute with them tripping over those big floppy long ears! Thank you for sharing a bit of the bassett love with us. :) I'm sorry again for your loss. Believe me, Zanie knows he was loved by you and Cesar. Your comparison to a chandelier is perfect. Our lives certainly Do dim a bit when our furry friends leave us. It will be four years since Chance, our Golden Retriever, died. We miss him every day, but we rejoice in the love we shared with him. Hugs to you and Cesar. Jim, I used to think people who lost animals and cried were nuts. But then my friends had pets and began to lose them and I realized how close they were to their pets and how much the pets were part of the family and how unconditional the love from a pet really is. the loss of a pet is really irreplaceable. Now I know. There are not words that can console. We can only offer our support and prayers and let you know we are here for you. You have to do the rest on your own, with Cesar, your mom, your sisters, the friends who can be there with you. But we are thinking of you. I understand your pain and my heart aches for you. I'm a crazy dog woman. Until recently, we had six wonderful dogs. Truly, each and everyone of them made my day in there very own way. I lost my dear Cozmo recently. He was 17 years old, a rat terrier, and even though he was blind he kept up with all his younger siblings. He was always at my feet when I was up in my craft cave. Often entertaining me with his snoring. I think of him and his antics every day.